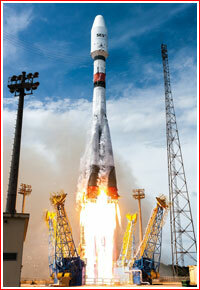 Within hours after the launch of a Soyuz-2-1a rocket from Baikonur, Kazakhstan, on April 4, 2019, on the opposite side of the Earth, an identical vehicle lifted off from the Atlantic coast of South America with four O3b satellites heading into a 800-kilometer orbit to provide low-cost Internet access around the world. 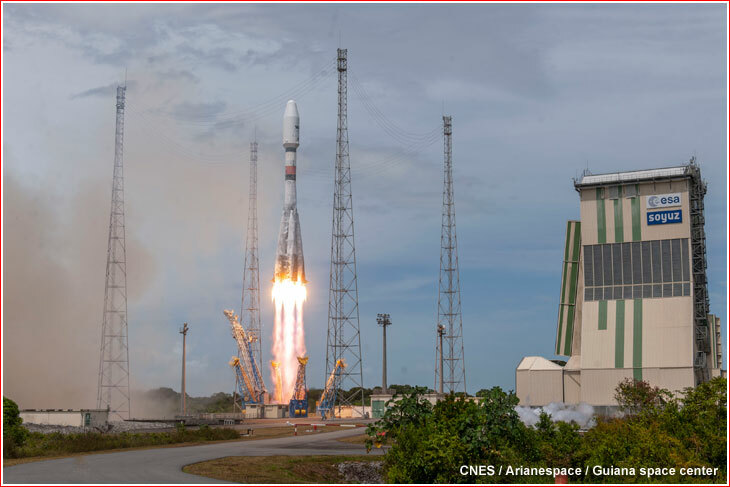 The European Arianespace consortium, which operates commercial Soyuz launches from the South-American facility, designated the mission as VS22, which denoted the 22nd launch of the Russian-built rocket from French Guiana. The fifth Soyuz launch with a quartet of O3b satellites is intended to expand the orbital Internet constellation from 16 to 20 spacecraft. According to SES Networks, which operates the system, the addition of the latest group will improve connectivity capabilities, increase performance, and serve to seamlessly scale the existing O3b constellation. It will also enhance coverage while providing greater service availability and reliability to cater for the increasing demand for bandwidth in government and in the telecommunication, cloud, maritime and energy markets, SES said. 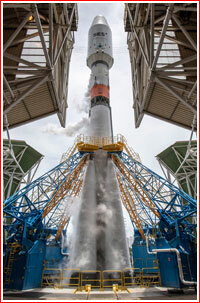 The VS22 launch campaign officially started in December 2018, with the integration of the first, second and third stage boosters of the Soyuz rocket at the rocket assembly building of the ELS facility in French Guiana. All four satellites for the VS22 mission were delivered to French Guiana from the Thales Alenia Space facility in the Rome, Italy, on February 2, 2019, and four days later, the pre-launch processing of the Fregat upper stage was initiated in Guiana. Due to the domino effect from the delay of the first OneWeb launch in February, the O3b mission had to be postponed from March 26 to March 29, 2019. Then, at the beginning of March, due to a delay of the Vega rocket mission from the ELA-1 facility in Kourou from March 14 to 21, the o3b launch was postponed from March 29 to April 4, 2019. 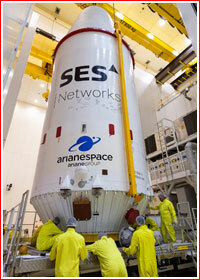 According to Arianespace, from February 23 to 27, three O3b satellites were attached to their dispenser inside S5 building in Kourou and the fourth spacecraft joined them on March 13. In the meantime, the Fregat was undergoing fueling with its hypergolic propellant and pressurized gas inside the FCube building from February 28 to March 18 and in parallel, the boosters stages of the Soyuz rocket went through pneumatic and propulsion tests. Their electric tests were performed between March 15 and 20. 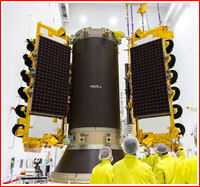 On March 25, the payload dispenser with the four satellites was delivered to the S3B processing building where it was mounted onto the Fregat and covered with the payload fairing during a period from March 26 to 29. 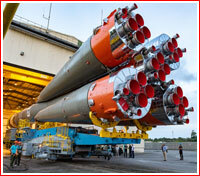 The three booster stages of the Soyuz rocket were rolled out to the launch pad, installed in vertical position and enclosed by the mobile service tower on April 1. On the same day, the payload section was also brought to the pad and hoisted to the top of the rocket with the crane of the service tower, completing the integration of the vehicle. The next day and on April 3, final integrated tests and launch simulations were conducted on the pad, clearing the booster stages for fueling and for the final countdown of the mission. *Launch was postponed for 33 minutes within an hour from the original liftoff time. 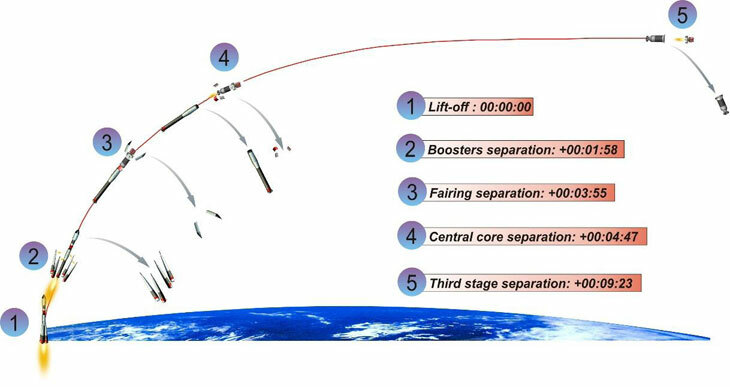 Initial powered flight profile during the fourth launch of O3b satellites on April 9, 2019. 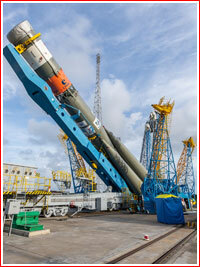 A Soyuz-ST-B rocket carrying a quartet of O3b satellites from the Soyuz launch facility near Kourou, French Guiana was scheduled to lift off at 1:30:37 p.m. local time (12:30 p.m. EDT, 16:30 UTC, 19:30 Moscow Time) on April 4, 2019. However within an hour from the originally scheduled liftoff time, it was postponed for 33 minutes. Arianespace did not specify the reason for the delay, but the official Russian TASS news agency then quoted an anonimous Russian source blaiming a failure of the European ground station and stressing that there had been no problem with the rocket. The new liftoff time was set for 17:03:37 UTC and, this time, the rocket lifted off as planned. Following the liftoff, the four boosters of the first stage separated from the still operating second (core) stage nearly two minutes into the flight and a minute later, the payload fairing protecting the payload from the aerodynamic loads split into two halves and fell away, safely above the atmosphere. The core stage continued firing and then separated four minutes and 47 seconds into the flight, just moments after the ignition of the third stage. The third stage continued its burn until nine minutes and 23 seconds into the flight and separated from the Fregat shortly before the vehicle would reach the orbital velocity. 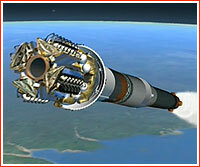 Like all preceding components of the booster, the third stage fell into the sea. In the meantime, the Fregat upper stage, carrying the satellites, initiated its first firing of the main engine over the Atlantic lasting around five minutes, to reach an initial parking orbit. Fregat then flew passively for a few minutes before firing its main engine for the second time over Africa. 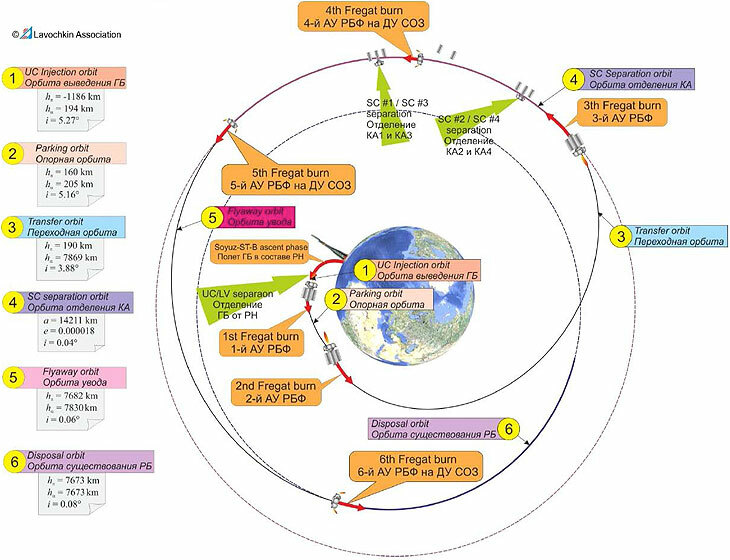 The 8-minute, 36-second maneuver stretched the circular orbit into an ellipse with its apogee (highest point) located 7,869 kilometers above the Earth, which is close to the target altitude of the mission. The stage and its payloads then climbed passively along the egg-shaped trajectory for one hour and 21 minutes. 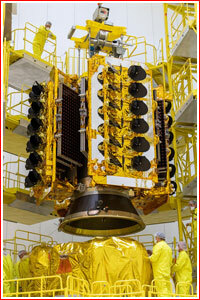 Near the apogee of the transfer orbit, Fregat fired its main engine for the third time. The maneuver, lasting five minutes and six seconds, circularized the orbit at the new altitude. The four satellites were released in pairs one after another at an altitude of 7,830 kilometers and an inclination of 0.04 degrees toward the Equator. According to NPO Lavochkin, the release of the satellite pairs took place at 22:04 and 22:26 Moscow Time on April 4, 2019. In the intervening period lasting around 20 minutes, Fregat performed a small maneuver with its attitude control thrusters to provide a safe distance between the two pairs of satellites. Satellites were programmed to be released slightly below their operational altitude and were designed to use their own propulsion system to reach their operational orbits. 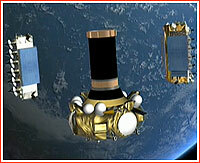 After releasing the satellites, the Fregat will maneuver into an orbit underneath that of the O3b constellation. Mission scenario for the fifth O3b mission on April 4, 2019. Credit: Arianespace.